Published by Cyril Huze September 16th, 2017	in Builders and Editorial. So much art in this machine! That is a very beautiful machine. THAT’S a “big wheel” bike I like! This the most transition bicycle to motorcycle where there are strong elements of both in one machine. I’d love to know more about the designer. Do u have a link? 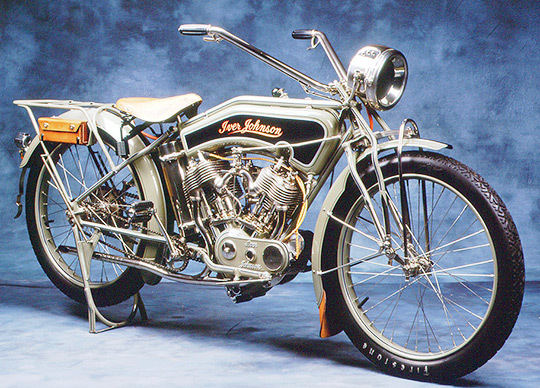 The National Motorcycle Museum in Anamosa, Iowa has a fine restored Iver-Johnson on display. It’s owned by guitarist Pat Simmons. The company went their now way with many engineering details and the design and fit and finish is exquisite, really well beyond typical bikes of the time. Here’s a link to the story the Museum ran about four months ago. Perhaps some of the information will be helpful. But the Museum is open every day, year around, so stop by and see Pat’s Iver and about 450 other bikes, tons of memorabilia. Love it, beautiful bike, it’s always fun to see what started it all, with this bike being in the mix. Great Bike ! I would be riding this one!!! Beautiful, I love that headlight.